Starting this fall, middle and high school students in Eugene School District 4J will benefit from new, districtwide world language curriculum for Spanish, Japanese and American Sign Language courses. For French studies and for language immersion programs, new curriculum will be adopted in the 2018–19 school year and implemented in schools the following year. Currently, middle and high schools use a variety of world language curricula, some of which rely on outdated technology and are not aligned with national or state standards for world language learning in the 21st century. This is the district’s first formal world language curriculum adoption in recent memory, made possible with bond funds approved by voters in 2013. The last informal adoption occurred in 2001. The new world language curricula emphasize cultural competency, collaborative learning, and analytical and evaluative skills, in addition to teaching comprehensive communication proficiency, which is consistent with national and state standards. A districtwide curriculum will provide better alignment and consistency among schools and as students move from middle to high school. The district undertook an extensive and inclusive process to select the new world language materials. Teams of teachers, specialists, technology experts and other district staff reviewed and analyzed the new curriculum options. Each world language program had its own review team: middle and high school Spanish, French, Japanese and American Sign Language programs. Teachers piloted the curriculum options with their students, and both provided feedback. Parents, students, educators and community members were invited to learn about the curriculum options and give feedback at an open house in March 2018. 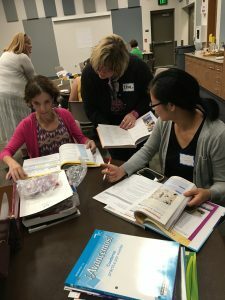 After the extensive review process, the world language adoption teams recommended and the school board approved the new curriculum in June 2018. American Sign Language I–IV: Bravo ASL! by Sign Enhancers, Inc.
Curriculum adoption for French studies was put on hold for a year so that staff could review a new product available this fall. New curriculum for language immersion programs (Spanish, French, Japanese and Mandarin Chinese) will be reviewed and adopted in the 2018–19 school year and implemented in schools the following year. For more information, see the presentation and other information about the adoption process and recommendations presented to the school board on October 4, 2017, and June 6 and June 20, 2018. Oregon Department of Education’s Second Language Standards (adopted in 2010) can be found here. This entry was posted in Bond, Featured, News. Bookmark the permalink. Both comments and trackbacks are currently closed.